Has the amount of time it takes for your clothes to get completely dried started to become longer over time? Or, is it common for you to need to extend the cycle before it's really completed its job? If either is the case, it likely means that your dryer's vent is clogged up. 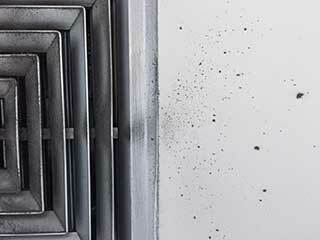 Dust, lint, and other substances blocking the slats of the vent makes it harder for the hot air to get through, and therefore makes it take far longer to dry your clothes fully. This also means that your clothes are getting tossed around for an extended period of time, which can damage them, as can the increased heat. Along with the longer run times and potential harm to your clothing, this issue may also reveal itself in your energy bill. The more time your dryer runs, the more energy is being wasted. If you've noticed your costs rising and aren't sure what the reason is, this may be the culprit. It may be an obvious sign, but it's one nonetheless! If it's possible for you to see your dryer's vent, you may be able to see for yourself that it's clogged up with lint, dust, and otherwise. If you touch your dryer, particularly the top of it, and notice that it's hotter than usual, this is a signal that the vent is extremely blocked up. Your dryer isn't able to properly exhaust the air because of this and can begin to overheat and even cause a fire if it's left this way. If this is the case, you should immediately turn off your dryer and refrain from using it until you can have the vent looked at! The most likely cause is the lint and other things stuck in the duct are starting to burn, and this could easily turn into a fire if allowed to continue. For the safety of your home and all inside it, periodic cleanings will help protect against this.